The early world war 2 Soviet force is shown below. I will be using this against Japanese and Hungarians, both of which I still need to paint. The battles against the Japanese will be a little bit anachronistic as I do not have the very early armour used by the Russians at Khalkin-gol (Nomonhan). In the meantime, feel free to have a look around this force in the gallery below. I will admit that I still need to add decals to the tanks. I am waiting until the mood takes me again to do that much fiddly cutting and decaling! Bell P-39 Airacobra and Polikarpov I-16 Rata Mosca. Bell P-39 Airacobra and Polikarpov I-16 Rata Mosca – both early war aircraft in use by the Soviets. Models by GHQ, bases by Raiden. Next Article What’s Next — More Soviets? very nice mate, and considerably larger than my Early War German forces. I might have to paint up some of the spares. How many points does it work out to be? I’ll add them up later … I want to add more infantry to this as well but I will do that as part of the late war Soviets and when I can add the tank riders. So, mine is bigger than yours? Really? The ones I have painted as specific Early War 40-41/42 are on my blog at http://aleadodyssey.blogspot.com.au/p/6mm-or-1285-world-war-ii.html but those were painted up very quickly for an early war game. So in addition to those I have all the DAK forces, plus the 1944/45 stuff, and then I have a floating reserve of a whole load of Pz IV, Stug etc that haven’t been painted yet. The LW stuff still needs topping and tailing with the Tigers, some more half tracks, and a whole load of Fallschirmjager. You still haven’t admitted to the points vale 😉 My LW Germans were up to about 15,000 last time I looked, and that didn’t include the latest bits of kit… 😉 Told you we should do swapsies. There is about 4000 points worth of Early Russians at the moment – not counting the T34/76 and Valentine tanks and assuming the T-60 is the same as the T-26 45mm light tank. I will need to upgrade my spreadsheets and spend an hour or so fondling the lead pile to work out the full extent of the Soviets but maybe 15,000 has you a little in the lead at the moment. And yes, we should have done swapsies. Want to talk about the 30YW stuff yet? More than happy to talk 30YW .. just pick what you want from the shoebox when you visit, and we can work it out. That is right impressive! Your basing is very good as well. I’m considering starting a 6mm soviet force. And I just missed the GHQ 20% off sale. Look forward to some battle reports with these guys. Some of the tanks are from CinC, most of the infantry and all the infantry support weapons, the engineers and the cavalry are all Adler but the rest is GHQ. If I did this again (as if) I think I would use the Ros and Heroics infantry – apart from price, in 6mm they look the business when painted and based. Adler have lovely animation, sometimes a little too animated, but parts are very fine – like most of the cavalry had sabres – not any more! CinC infantry just seem too slight and the GHQ infantry seems to lack a little character. When I get around to the Japanese we’ll see how good the Ros and Heroics are. GHQ and CinC will mix comfortably in the same units. Ros and Heroics vehicles are a little smaller (1/300 vs 1/285) but their infantry will mix well with GHQ/CinC vehicles and artillery. The CinC tanks have quite fine gun barrels – the T34/76s are CinC and it seems like the barrels bend under their own weight. The GHQ barrels seem a wee bit stronger. No comment on Irregular 6mm, I have not used them. Can I use one of your pics on my blog (with credit of course) in a post about your army and links back to your story? Sure, no problem. Go right ahead. Nice to see another fan of 6mm gaming. Very nicely painted and based. The base size is perfect for 6mm WW2 and Modern. Keep up the good work. 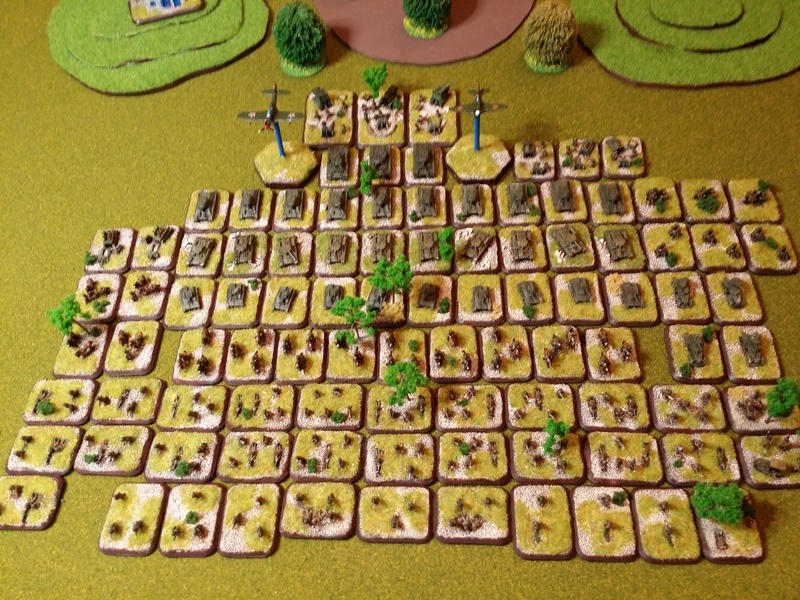 I like the way the FoW base spaces the 6mm stuff out – looks crowded in 15mm but just about right in 6mm. Where did you get your bases from – Litko? I got them of E-bay. I just type in FOW bases and a selection normally comes up. I wish I had started to use them on my WW2 early war but they look good with the modern kit.